The Rocelco ADR is an affordable desktop sit/stand option that is a bit rough around the edges. However, it is as sturdy as anything on the market and get's the job for half the price of its competitors. Rounding out our series on desktop standing desks, today I’m taking a closer look at the Rocelco ADR Height Adjustable Sit/Stand Desk. As you might recall, I’ve talked quite a bit about the pros and cons of desktop sit/stand desks. In short, these desks provide a way to get into the standing desk market without purchasing a completely new desk. Instead, they rest on top of your existing desk and when fully retracted behave more or less the same as your existing sitting desk. 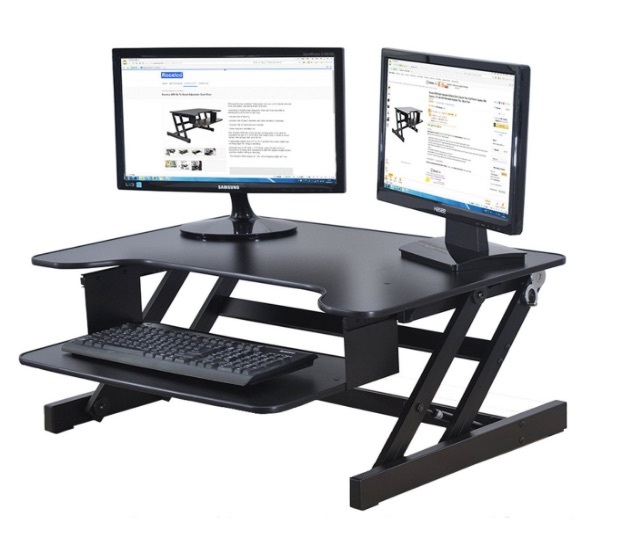 The desktop platform can be extended in order to allow you to stand. Previously, we’ve taken a look at the market leader in the segment, the Varidesk Pro Plus as well as the up and coming X-Elite Pro. In contrast, the Rocelco ADR provides a more affordable alternative, and though it hasn’t quite reached the ubiquity of the Varidesk and X-Elite, it proves to be a formidable competitor in this emerging space. Rocelco is largely known for their wall mounts and braces for TVs, monitors and other electronics. As it turns out, the same sort of sturdy construction that makes for great wall mounts also makes sturdy desks. In fact, the Rocelco ADR is rated to support up to 50 lbs. fully extended, 15 lbs. more than the comparable Varidesk model. In practice, I think at 50 lbs., you might be pushing it a bit, but the frame on the Rocelco ADR is, relative to much of its competition, built like a rock. The Rocelco ADR is 32″ inches wide, which is also comparable to the mid-range desk models from Varidesk and X-Elite. In practice, 32″ inches tends to be wide enough to fit one large Thunderbolt monitor or two more standard sized monitors if you prefer a dual monitor setup. Realistically, it probably isn’t big enough to fit monitor speakers or other large peripherals in addition. 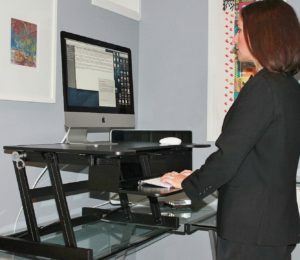 However, if you are looking to elevate those items as well, you’re likely going to be looking for a fully-fledged motorized standing desk anyway. For a desktop sit/stand desk, the Rocelco ADR provides as much functional space as nearly any other on the market. The Rocelco ADR can be height-adjusted up to 16.3″ inches as well, which is fantastic for us taller folks. Like the Varidesk Pro Plus, the Rocelco ADR features a separate platform and keyboard tray. The platform is mounted about 4″ inches above the keyboard, which means that you may be able to get away without a monitor stand, particularly if you’re shorter. In addition, it means that you won’t have to move your keyboard and mouse on and off the platform and you transition from sitting to standing. So where does the ADR cut corners? Well, the Rocelco has just 4 height-adjustment settings in comparision to the 11 found on the Varidesk. In reality, that didn’t prove to be much of an issue for me because I tend to either use desktop sit/stand desks fully extended or fully retracted, but it might be an issue for someone who really wants to dial in the proper standing height. There are two items in particular that I found to be somewhat lacking. First, the platform is mounted to the frame using screws that do not sit perfectly flush with the top. As a result, if you prefer to mouse directly on the desk, you may be in for a bumpy ride. It isn’t anything that a reasonable mousepad can’t fix, but it is nevertheless something that could have been designed in a more polished manner. In fact, the screws and glue mounting generally felt less than ideal. Second, I just didn’t find the latch mechanism as intuitive as those found on the Varidesk. The adjustment latch is on the back ,which takes some getting used to and felt awkward to me. Frame is Sturdy as a Rock – Supports up to 50 lbs. Latch Mechanism – Located on the back of the desk and less than 100% intuitive to use. The Rocelo ADR proves to be a fantastic challenger in the burgeoning market for desktop sit/stand desks. It can be had for nearly half the price of the market leaders, yet in many ways is just as functional and sturdy. While it may not be quite as polished when it comes to the platform mounting and latch mechanisms, it is up to par in the areas the really matter — namely platform rigidity and sturdiness when extended. Final Verdict: If you are looking to move into the world of standing desks, but on a limited budget, this might be the desk for you.